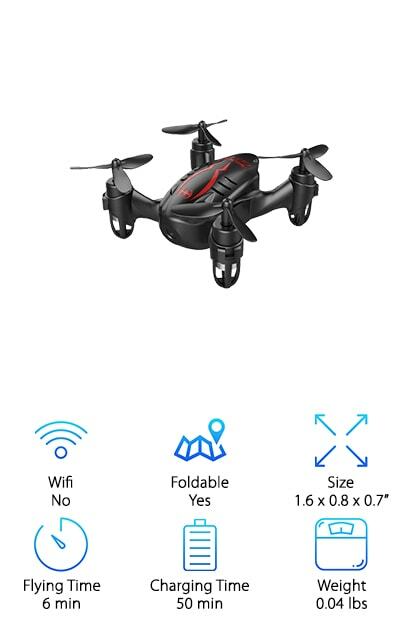 If you’re looking for an awesome way to take aerial photographs or get a new perspective on the world, the best mini drone with camera is just what you need. If you’re not sure where to begin or need help finding the best cheap quadcopter, you’re in luck. We did the research and put together these reviews to help you out. Before we get started, let’s look at some of the important features you need to know. 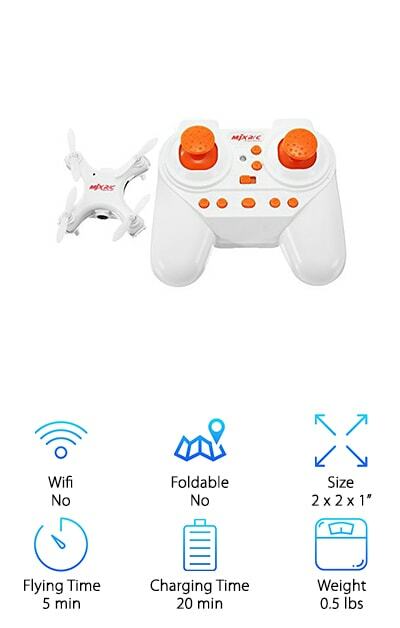 Wifi: Wifi equipped drones let you connect the drone right to your smartphone. You can see the first person perspective of the drone while it’s flying or sometimes even control it, right from your smartphone’s touchscreen. Foldable: While these drones are all pretty small to begin with, some of them do fold up and get even smaller. This makes them a little easier to transport without worrying about damaging the blades, which can be delicate at times. Size: Again, most of these drones are pretty small. In fact, you’ll likely be really surprised at exactly how small they are. For reference, the largest one is only 7.7 x 7.7 x 1.8 inches while the smallest is 1.6 x 0.8 x 0.7 inches. Flying Time:- Even though these mini drones are small, the flying time is relatively limited. They fly for about 4 - 10 minutes. Note that the number we included in each review is the longest time each drone can be expected to fly. Charging Time: Charging time is how long it takes the battery to completely charge. The number we used for each product is the shortest time that the battery can charge in. Note that it might take a little longer. Weight: It’s not a surprise that these mini drone weight next to nothing. In fact, only one of them tops a pound and the lightest one is 0.03 lbs - which, if you can believe it, is less than an ounce! Now that we know more about some of the important features of mini drones that have cameras, let’s get going with our reviews. If you’re in a hurry, make sure you check out our top and budget picks, numbers 1 and 2 on our list. That’s the best place to start to get an idea of what’s out there. If you have the time, check out the rest of the awesome products on our list. Ok, onto the reviews! Our top pick for best mini drone with camera come from Rabing. First of all, you can line your drone to Wifi and get real image and video transmission. What does that mean? You can use the image to fly and capture photos at the same time. 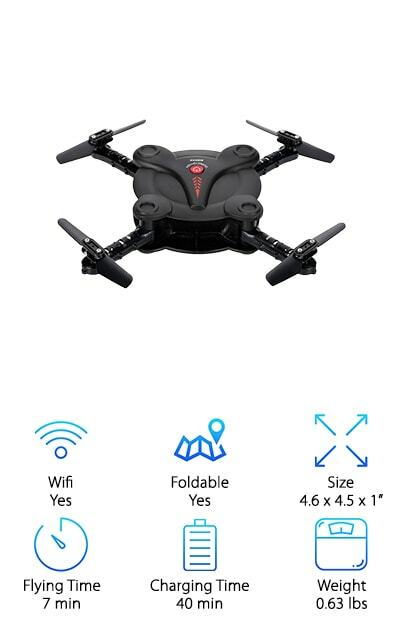 The remote control was designed for minimal interference but get this: you can download an app and control this drone right from your smartphone. It’s also really small (seriously, really small) and it folds up even smaller so it’s super easy to carry around. It’s capable of flying up to 100 meters away, giving you not only a great view but also an awesome way to get unique photos of your house, property, and your family. 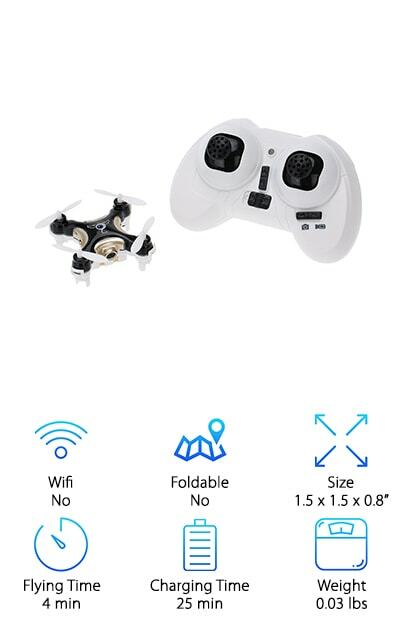 If you’re looking for the best budget drone with camera available, the GoolRC CX-10C Mini Quadcopter is definitely worth checking out. There are plenty of reasons why this is our budget pick. For starters, the 6-axis gyro gives the small drone has stable flight. Oh, and it can do a 360-degree flip. 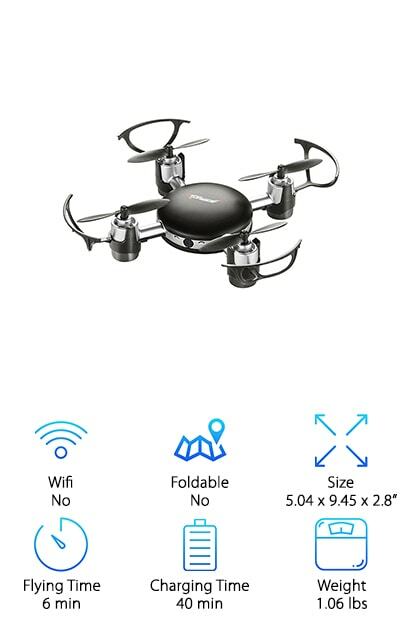 Looking for a mini drone you can fly at night? The LED lights let you do just that. That’s not all. It comes with a set of spare wings, too, which will make this drone last even longer. It also includes a charging cable so you’ll always be ready for your next flight. 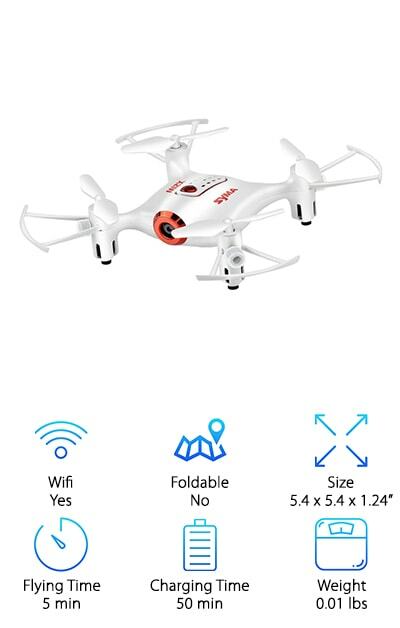 This best affordable drone with camera isn’t suitable for children under 14 years of age. 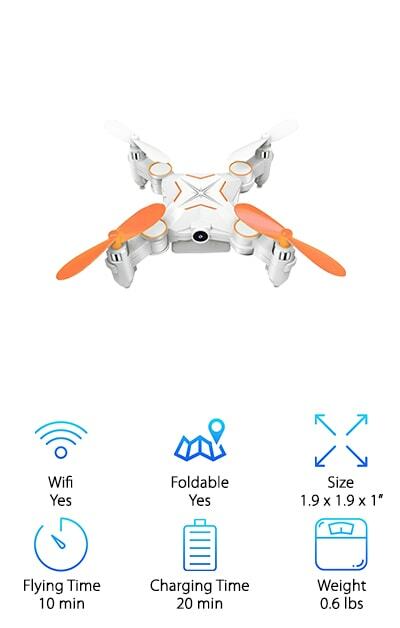 If you have some experience and are looking for the best small drone with camera but aren’t interested in using one for beginners or kids, this one from DROCON is for you. Believe it or not, this tiny drone has a 720p HD camera that allows you to take awesome, crystal clear video and photographs. For a little extra help keeping the flight path, there’s a headless mode. What does that mean? The orientation of the drone stays constant. You’ll always know where the which way to turn and right where you’re heading. Ready for more advanced flying? Check out the 360 degree stunt mode. One more thing: it’s made out of tough nylon material that makes it durable, flexible, and foldable. In fact, this one doesn’t even require propeller guards. 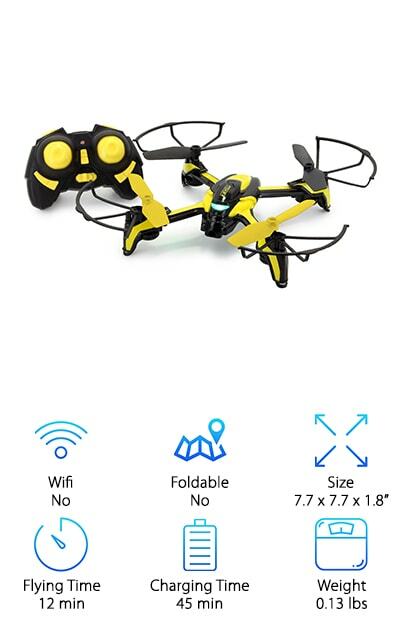 EACHINE makes this RC quadcopter E10W Mini Drone that comes in next on our list. There’s a lot to love about this one. For starters, the real time Wifi transmissions shoes you the photos and videos that the drone is shooting right on your smartphone. In fact, your smartphone slides right into the remote. Just download the app, get your phone in place, and use them together to get in some serious flying and take some awesome photographs. That’s not all. We were really impressed by this drone’s maneuvers. Up, down, forward, backward, left, right, sideways - this one can do pretty impressive flying. Get this: you can even do flips and rolls at the push of a button. One more thing: it comes with 4 spare blades, too. 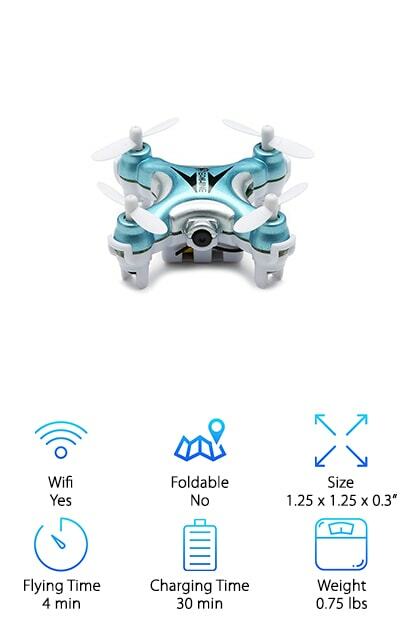 We’re calling this mini drone from Goolsky the best drone with camera for beginners. One of the things we like most about it is that it’s foldable, which makes it nice and compact, easy to transport and store. Wifi allows you to monitor what the drone sees in real time using your smartphone. In fact, the remote control as a smartphone holder so you can clip it in place and see right where you’re flying as you’re using the controls. There’s even a gravity induction mode where the drone flies in correspondence with the angle of your mobile phone. One of the features we really liked is the altitude hold function. Here’s how it works: release the throttle and the drone hovers at the current height. Here’s a good choice if you’re looking for the best camera drone for kids. The Tenergy Phoenix Mini Drone is packed with features. One of the coolest things it does is auto hovering. It suspends itself in midair even after letting go of the joystick. In addition to just being awesome, this also makes it pretty easy to fly. That’s one of the main reasons this is such a great choice for kids. Want to do something a little more exciting? This drone can do 360 degree rolls at the press of a button. And, with 720P HD, you’ll get amazing aerial shots and video. It comes with a good number of extras, too, like blade guards, extra blades, a screwdriver, and a charging cable. 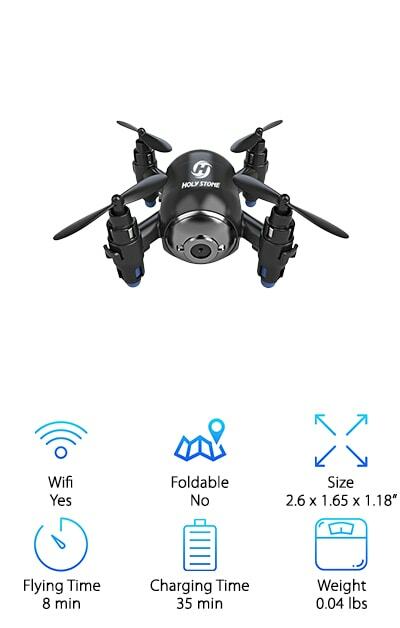 The Holy Stone HS180 Mini Drone is a great choice because it’s got a little something for everyone. No matter what your skill level, you’ll love this drone. It’s palm-sized with flexible blades, perfect for flying both indoors and outdoors. This one also has an altitude hold function. Release the throttle and it hovers right at the height it was. This is not only great for control and learning to fly. It’s also really good for taking photos and video and making sure you never miss a cool shot ever again. Flips and rolls can be done simply by pushing a button. And get this: the one key home return. Just push it and the drone automatically returns to the place where you paired it initially. One of the things that makes the Syma X21W Mini Drone great is how easy it is to fly. Why do we say that? The design was recently upgraded to be more stable with some extra features added in. For starters, there’s a one key takeoff and landing feature. Get this: the landing button makes it return to the position where it took off from, automatically. So, how does it fly? Smooth and stable. It really is a great choice for kids and beginners. Something we really liked about this one is the app. It has a flight path feature. Just trace the path you want the drone to fly and the drone takes care of the rest. A screwdriver, USB charger, and mobile phone clip are also all included. Maybe you want something that isn’t so tied to your smartphone and you’re wondering if there’s anything like that available. The answer is, yes. There is. The Top Race Mini SPY Drone has an LCD screen on the remote that allows you to see the first person view of the drone as it flies. You get HD footage, right in your hand, no smartphone needed. But this drone is more than convenient; it does some awesome things in the sky, too. The 6-axis gyro system makes it easy to fly and maneuver, but getting it to return to you is the easiest thing of all. Just put the return to home button and it automatically comes back to the same place it took off from. The REALACC X-Series mini drone has a 6-axis gyro that gives stable flight while keeping it really easy to control. There’s more. It can go up, down, forward, backward, left, right, and even do rolling 360 degree turns and spins. It has a headless mode if you need some extra help getting it to go where you want it to. Oh, and a hovering mode plus one key return. Basically, this one is full of flying options. Plus, you can do it all while taking stunning pictures with the built-in camera. We really like the LED lights, too. It comes with a lot of goodies, too, like a rechargeable battery and cable. And get this: you even get a 4GB SD card and card reader.